A4 Size 7.3 x 9.4 in. (186 x 239 mm) 8.3 x 11.7 in. A4 Mounted 7.3 x 9.4 in. (186 x 239 mm) 11 x 14 in. (272 x 351 mm) 11.7 x 16.5 in. MEDIUM 16.3 x 20.9 in. (412 x 530 mm) 19.5 x 24 in. LARGE 20.9 x 26.8 in. (530 x 682 mm) 24 x 32 in. THANGKA 21 x 27.25 in. (533 x 692 mm) 22.3 x 29.5 in. NOTE: The original unbrocaded thangka of this unique Wheel of Existence composition by Sunlal is for sale, Priced at GBP £1,740.00. The ‘Wheel of Existence’, also known as the ‘Wheel of Life or Becoming’ (Skt. bhavachakra; Tib. srid pa’i khor lo), is a vivid pictorial and didactic representation of the Buddha’s teachings on the sufferings and impermanence of samsara or cyclic existence. This particular thangka from the studio of Sunlal Ratna Tamang is a brilliant contemporary Nepalese rendition of this iconic Tibetan image, in that it portrays some innovative elements of the Nepali-Tibetan culture that now characterizes much of the Himalayan region. However, these elements are entirely accurate in their portrayal of the conditions that still prevail within the six realms of cyclic existence. The entire wheel is clutched within the hooked claws of a huge and fierce red demon (Skt. mara), who bites down on the wheel with his sharp teeth and fangs in the act of devouring it. This demon represents the ultimately impermanent nature of all phenomena that appear within cyclic existence or samsara. This figure is traditionally identified with Yama (gshin rje), the ‘Lord of Death’, who is most frequently depicted in the extremely wrathful red or blue form of a demon, with three bloodshot and angry round eyes, a fiery mustache, beard and eyebrows, and piled-up coils of curly hair. As adornments he wears a jewel-topped five-skull crown that is bound with a silk ribbon, golden earrings, bracelets and anklets, and a tiger-skin loincloth. This demonic figure can also be depicted without adornments and only two bulging eyes, where he may be identified as 'Mara' (Tib. bdud), a term which derives from the Sanskrit root marana, meaning ‘death or cessation’. In Buddhism ‘Mara’ assumes a four-fold personification: (1) skandha-mara, as the mara of the five ‘impure aggregates’; (2) klesa-mara, as the mara of ‘emotional defilements’; (3) devaputra-mara, the ‘son of the gods’ mara of sensual desires and temptations; (4) mrtyu-mara, as the mara of death. In the central hub of the wheel are the three creatures that represent the three principal afflictive emotions, which are commonly known as the ‘three poisons’ of ignorance, attachment, and aversion. The pig represents ignorance or delusion; the bird or pigeon represents attachment or desire, and the snake represents aversion, hatred and fear. These three creatures constantly chase each other around in circles as they attempt to bite each other’s tails. Both the pigeon and the snake have emerged from the pig’s mouth, indicating that desire and aversion arise from the primordial poison of ignorance, which in turn give rise to endless cycles of further desire, aversion and ignorance. In the central hub of the wheel are the three creatures that represent the three principal afflictive emotions, which are commonly known as the ‘three poisons’ of ignorance, attachment, and aversion. The pig represents ignorance or delusion; the pigeon represents attachment or desire, and the snake represents aversion, hatred and fear. These three creatures constantly chase each other around in circles as they attempt to bite each other’s tails. Both the pigeon and the snake have emerged from the pig’s mouth, indicating that desire and aversion arise from the primordial poison of ignorance, which in turn give rise to endless cycles of further desire, aversion and ignorance. The first ring or circle that surrounds the central hub represents the bardo or ‘intermediate state’ between death and rebirth, where sentient beings either ascend towards a fortunate rebirth in one of the three higher realms in the light of the white left side, or tumble and descend to a miserable rebirth in one of the three lower realms in the darkness of the black right side. The five fortunate human beings that ascend freely in the white semi-circle wear the attire of a Nepali man, a Tibetan laywoman, an aristocrat, a lama, and a tantric practitioner, who are all being led by a dancing and drum-playing blue daka (the male counterpart of a dakini) at the top. Whereas the four terrified humans who tumble down in the black semi-circle are all naked and bound together by a rope that is being pulled by a blue demon at the bottom, while the red demon at the top pushes them. The wide area of the wheel’s second ring illustrates the conditions that prevail for migrating beings within each of the six realms of samsara or cyclic existence. With the three higher realms of the humans, the gods or devas, and jealous anti-gods or asuras, respectively appearing at the left, top centre, and right in the upper half of the wheel; while the three lower realms of the animals, hell beings, and hungry ghosts or pretas, appearing at the left, bottom centre, and right in the lower half of the wheel. The three lower realms are characterized by the three primary defilements or poisons of delusion or ignorance (animals), avarice or greed (hungry ghosts), and aggression or hatred (hell beings); while the two higher realms of the gods and asuras are respectively afflicted by the emotions of pride or exaltation (gods), and jealousy or envy (asuras). All of these five emotional defilements exert an influence over beings in the human realm to a greater or lesser extent, so these emotive conditions may be viewed as psychological states within our common realm of humanity. The realm of human beings (Skt. nara; manusya) in the upper left area is characterized by various forms of suffering, along with the ‘eight worldly concerns’ of: pleasure and pain; praise and blame; gain and loss; fame and defamation. The ‘three fundamental sufferings’ are: the suffering of change; suffering upon suffering, and suffering in the making. Then there are the four sufferings of: birth, sickness, old age, and death. And the four sufferings of: being separated from those one loves; encountering those one does not like; not getting what one want, and the suffering that arises from the five aggregates or skandhas. Snow peaks, clouds and rows of tree separate the human realm from the animal realm below and the god realm above. In the foreground people are enjoying a picnic in front of their tent, while a man disembowels a sheep with a dog waiting nearby. Above is a peasant carrying a load of stones, two nobles on horseback being welcomed by a man offering a white khata or scarf, and several pilgrims are circumambulating a monastery. In the courtyard of this monastery a monk proves his skill in debate before three seated lamas or geshes, and behind is enshrined an image of Shakyamuni Buddha. The realm of the gods (Skt. deva) at the top of the wheel is characterized by pride and states of blissful exaltation, for the gods of the desire realms enjoy luxurious comfort, perfect health and happiness throughout their lives, which may last for eons or kalpas. The heavenly realm depicted here is known as the heaven of the ‘Thirty-three’ (Skt. trayastrimsa), which is ruled over by the great Vedic god Sakra or Indra, along with his retinue thirty-two subsidiary gods. This divine realm is the second of the six ‘Desire Realms’ (Skt. kamaloka), and above these are the seventeen ‘Form Realms’ (Skt. rupaloka), where the gods that are without desire vastly increase in their unimaginable glory, dimensions and lifespans as they ascend upwards. And at the very summit of existence are the four ‘Formless Realms’ (Skt. arupaloka), where the gods do not possess any attribute of form whatsoever, and thus are far beyond the comprehension of human beings and the other gods below them. Indra’s heavenly palace is depicted at the centre of the god realm, with its gemstone walls, golden roofs, and lotus-pool encircled by grove of magnificent wish-granting trees that fulfill every desire. The deified form of Indrasakra sits enthroned at the centre of his realm playing upon his vina or lute, with an assembly of seven other gods playing cymbals, sounding a white conch, and holding the offerings of a jewel, a bowl of fruit, a fan, a parasol, and a mirror. The realm of the jealous gods or anti-gods (Skt. asura) in the upper right area is characterized by intense envy and jealousy, which is essentially caused by the great but contentious wish-fulfilling tree that separates them from the god realm. For although this legendary tree is firmly rooted within the asura-realm, its upper branches and magnificent canopy ascend into the god-realm, with its exquisite flowers and ambrosial fruits providing all of the gods needs and desires. Thus the asuras gaze upward towards the god-realms with intense envy and unbearable resentment, and are forever taking up arms to wage war against the gods, who are essentially peaceful by nature. The king of the asuras is shown in his palace giving orders for war to his minister and two of his generals, while another asura tries to cut through the trunk of the great wish-fulfilling tree with his axe. The armies of the gods and asuras are shown confronting each other above, with a dense shower of arrows passing between them. Amidst the clouds Indra is shown leading his army of gods to war, as he rides upon his great white elephant Airavata, whose trunk wields a mighty discus or chakra with ten sharply pointed blades. Indra’s weapons are his vajra and a long spear, while his lieutenant (at the lower left) is giving the order for the archers’ to fire with his raised arm. However, the outcome of the perpetual wars between the gods and asuras are always predictable. For the gods are larger and far more powerful than the asuras, and whatever wounds they receive heal quickly: the gods can only be killed by having their heads cut off, while the asuras are vulnerable in every part of their body. The realm of the hungry ghosts (Skt. preta) or tormented spirits appears below the asura realm in the lower right area, and these unfortunate beings are characterized by the defilements of extreme avarice, insatiable craving and miserliness. The landscape that these miserable beings inhabit is completely desolate, like a barren desert with outcrops of sharp rock, where the summers are unbearably hot and the winters freezing. Pretas are traditionally represented as hideous ghouls, with enormous stomachs, large heads, and stick-like skeletal limbs that can barely support their weight. Their rough skin is covered with boils and bristling hairs, their throats are as narrow as a stalk, while their mouths are like the eye of a needle. Some have knots in their neck and are unable to swallow, others are so consumed by greed that they breathe, excrete and urinate fire. They constantly suffer from intolerable hunger and thirst, heat and cold, fatigue and fear, and are endlessly plagued by mirages. Food and water turns to filth, vomit or pus when they try to grasp at it, and if they manage to swallow even a morsel it burns like molten iron in their huge distended bellies. Occasionally the mirage of a distant pool of water or a fruit-laden tree may manifest, enticing the pretas to struggle and fight to reach that spot on their fragile limbs. But when they finally arrive there the water will have turned into filth or sharp rocks. The pretas are shown here as naked beings, three of whom have arrived at a mirage of fresh water and a fruit tree in the bottom are, only to find the water has turned into a lake of blood, and the tree into razor-like rocks. Directly above them is the large-bellied form of a preta-queen; the mother of countless starving baby pretas who relentlessly struggle to suckle from her barren sagging breasts. To her left another preta sits in front of a pavilion guarding the coveted treasure caskets, silks and jewels that surround her, while in the upper right area three frightened pretas cower in the lee of several steep and isolated hills. To their left appears the cloud-borne form of Padmapani Avalokiteshvara, the bodhisattva of boundless compassion, who miraculously creates a stream of nectar from his right palm to nourish the four poor starving pretas that squat before him. The realm of the animals (Skt. tiryak) appears to the lower right below the human realm, and is the only visible realm that we share together as embodied sentient beings. The animal realm is characterized by the defilement of ignorance, confusion or stupidity, yet although the living beings of this realm may experience enormous suffering, the duration of this suffering is far less than that experience in the hungry ghost or hell realms. Thus rebirth in the animal realm is in general considered to be more fortunate that rebirth in either of the other two lower realms. The animal realm is divided into two categories, with the aquatic creatures that live in the ocean depths appearing in the lower area, with the creatures that live scattered over the face of the earth appearing above. Collectively these creatures are grouped into four classes: Those with many legs, which include most insects and crustaceans: Those with four legs; mammals: Those with two legs; apes and birds; and those with no legs, such as snakes, fishes and worms. Amidst the waves appear a scorpion and butterfly (insects); frogs and snakes (reptiles); ducks, geese and herons (birds), and various kinds of fishes. Two crocodiles, a walrus, a jewel-holding water-monster, and the palace of a nagaraja or ‘serpent-king’ also appear amidst the waves, with the white naga-serpent holding a precious gem as a serpent-crowned ‘treasure guardian’. On the land above the ocean a white snow-lion appears upon the snowy peaks, while emerging from the trees are two yetis or ‘abominable snowmen’, a yak, a rhinoceros, two elephants, a giraffe, a leaping monkey, and the head of a tiger. The denizens of the hell realms (Skt. naraka) appear in the bottom segment of the wheel. Buddhist descriptions of these various hells are vividly explicit, and essentially consist of the eight hot hells and the eight cold hells. All of these sixteen hells are characterized by the evil actions of body, speech and mind that arise from the defilement of extreme anger, aggression, hatred and aversion. However, the hot hells are mainly characterized by impulsive actions committed through a passionate or fiery rage, while the cold hells are in general reserved for premeditated actions of cruelty committed through revenge or cold malice. The eight hot hells are illustrated in the four fiery arcs or tiers on the left, with the ‘Reviving’ hell (Skt. sanjiva) and the ‘Black Thread’ hell (Skt. kalasutra) appearing in the upper tier. Beings continually slaughter each other before repeatedly being brought back to life again and again in the Reviving hell; while burning black lines are seared onto the body to serve as guides for the saw-cuts perpetually inflicted in the Black Thread hell. The remaining six hot hells that appear on the three tiers below are known as the: ‘Crushing’ (samghata); ‘Howling’ (raurava); ‘Great Howling’ (maharaurava); ‘Heating’ (tapana); ‘Intense Heating’ (pratapana); and the hell of ‘Ultimate Torment’ (avici). The eight cold hells are shown in the eight sections of the four tiers on the right, where naked human beings progressively experience greater agony because of the increasing coldness. They are known as: the hell of ‘Blisters’ (arduba); ‘Burst Blisters’ (nirabuda); ‘Chattering Teeth’ (atata); ‘Lamentations’ (hahava); ‘Blue Lotus’ (utpala); ‘Lotus’ (padma), and the hell of ‘Great Lotus’ (mahapadma). The last three progressively freezing hells relate to the increasing number and depth of raw ‘lotus-like’ cracks that inflict the tormented beings in these realms. Located at the bottom between the hot and cold hells are the four ‘Surrounding Hells’, which additionally serve to prevent anyone escaping from any of the sixteen hells before their time is up. The first of these is the fiery ‘Pit of of Blazing Embers’ (kulukula), with the ‘Swamp of Putrid Corpses’ (kunapa) above. While the other two are known as the ‘Road of Razors’ (kshuramarga), and the ‘Grove of Spikes’ (kilavana), with the sharp sword-like leaves of a shalmali tree appearing above. Between these four auxiliary hells is a massive iron cauldron, where a throng of hell-beings are being boiled together alive in molten copper, with two of Yama’s demonic blue henchmen forcing their heads down with spears. Above is a window-like frame, within which an inverted male and female adulterer are imprisoned. To the left a man is being crushed underneath a white stupa or chorten, the weight of which forces him to vomit a large pool of blood, which a farmer plows with his oxen. Next to the stupa another man is imprisoned within the coils of a python, and both of these naked beings represent monks who have violated their religious vows. 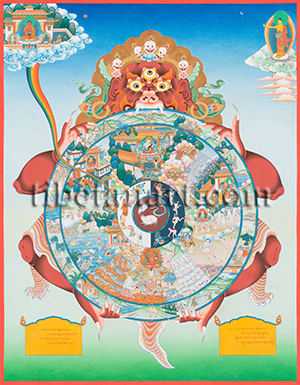 An unusual feature of this Wheel of Existence thangka is that only the eight hot and eight cold hell realms are individually delineated, while all of the other realms are separated by clouds or hills, rather than by the distinct radial bars that appear in most Wheel of Life compositions. And thus the wrathful figure of Yama and his ‘Judgment Court’ appears in the upper area of the hell realm, with clouds separating him from the animal realm on one side, and hills separating him from the preta realm on the other. Yama or Yamaraja, as the ‘King of the Dead’, is an important ancient Vedic deity of pre-Buddhist Indian origin, whose role as the ‘Lord of the pitris or Ancestors’ derives from his being the first righteous mortal to die. He was then mourned by Yami, his surviving ‘twin’ (yama) sister, and recognized as the ‘restrainer’ (yama) because of his moral contact. In this respect he can be viewed as an impartial judge of the dead, whose ‘mirror of karma’ clearly reflects the deeds of the newly departed in their ‘life review’, who is assisted by his scribe Chitragupta, the ‘Keeper of Secrets’, who records each individual’s good and evil deeds of body, speech and mind in his karmic book of records. Yama is red and wrathful, with three round eyes, a gaping mouth, and he sits upon his golden sun-disc and lotus throne amidst a blazing mass of awareness fire. He wears gold and bone ornaments, a five-skull crown, a tiger-skin loincloth, a billowing silk scarf, and his right and left hand attributes are his sandalwood ‘staff of death’ and his ‘mirror of karma. A newly-deceased naked human being sits in front of Yama, witnessing all of his past deeds in Yama’s mirror, while Yama’s monkey-headed blue assistant (to the left) records these deeds on a written scroll. On either side of this penitent being are two piles of white and black pebbles, which are meted out by flanking white and blue-black gods as symbols of this being’s good and evil deeds. These pebbles are then balance on a scale by a blue bull-headed assistant of Yama (to Yama’s left), where fortunately the positive white pebbles far outweigh the black ones. Meanwhile, another stag-headed assistant of Yama (right) leads another frightened naked being into Yama’s courtyard, while behind him appears a long file of other beings awaiting to be judged, who all have their palms-folded in supplication. 1. Fundamental Ignorance (Skt. avidya), symbolized by a blind man stumbling along with his arms outstretched: which represents an absence of understanding about the nature of reality and the 'Four Noble Truths'. And mistakenly perceiving the five mental and physical aggregates as an independent or permanent self. 2. Habitual propensities or volitional formations (Skt. samskara), symbolized by a Nepali potter fashioning a store of clay vessel on his wheel, which may be either good or bad in quality. This represents the mental fabrications or conditioned positive and negative karmic formations that arise from ignorance and a previous existence, which are stored in consciousness. 3. Consciousness (Skt. vijnana), symbolized by two monkeys with human faces in a tree, one of which is in a foetal position, while the other is playful and leaping. These represent the karmic fruits that are accumulated in past lives and tasted in future lives. The leaping monkey represents the impelling and resultant cognitive awareness that establishes a link between lives. 4. Name-and-Form (Skt. nama-rupa), symbolized by four people in a moving boat: representing the combination of the five aggregates or heaps (Skt. skandha) that constitute the elements of sentient existence – with the four ‘name’ attributes referring to feeling, perception, motivational factors, and consciousness, and the ‘form’ aspect relating to the physical body (boat). 5. Sensory Fields (Skt. ayatana), symbolized by an empty house, often with five windows and a door, representing the five physical senses of sight, sound, smell, taste and touch (windows), along with the mind or mental sense base (door). 6. Contact (Skt. sparsha), symbolized by a man and woman kissing and embracing: representing the coming together of the sense organs and the sense consciousness’s with any object they may perceive or apprehend. 7. Sensation (Skt. vedana), represented here by a man running backwards blindly: indicating how contact gives rise to feelings and sensations of desire and aversion; or pleasure and pain. This link usually shows a man blinded by an arrow in one eye. 8. Attachment (Skt. trishna), symbolized by a man drinking tea or alcohol offered by a servant: showing how desire give rise to a thirst for not wanting to be separated from pleasurable sensations, and to avoiding unpleasant sensations. 9. Grasping (Skt. adana), symbolized by a couple collecting all the fruit from a tree into a big basket: indicating how increased attachment to sensual objects and mental views can develop into an indulgence or craving for pleasure, sensual gratification, status, power, wealth, fame, etc. 10. Becoming (Skt. bhava), symbolized by a pregnant woman: showing that through attachment and grasping one activates the karma that matures through conception and gestation towards existence in a future rebirth. 11. Birth (Skt. jati), symbolized by a woman giving birth: representing how the potency of this karma actually determines the conditions and place of this future rebirth. 12. Old age and Death (Skt. jara-marana), symbolized by a corpse being carried on a bier to the charnel ground; representing how following on from birth the psycho-physical aggregates develop, change, decay, and finally cease, leading on to endless cycles of birth, death and rebirth within the six realms of existence. A long rainbow pathway winds upward from Yama’s side directly up to Amitabha Buddha’s Pure-Land of Sukhavati in the painting’s upper left corner. Along this pathway the minute figures of five fortunate beings are beginning to ascend, who will soon be miraculously lotus-born with ‘sexless’ bodies within lotus blossoms, untainted by any of the defilements of cyclic existence or samsara. The first of these beings is a Nepali, while the other four are monks and lay-practitioners. Amitabha, the red Buddha of ‘Boundless Light’ sits enthroned in his divine mansion at the centre of his western paradise realm of Sukhavati, meaning the ‘Place of Bliss’. Flanking Amitabha to his left and right are white Avalokiteshvara and blue Vajrapani, the two great bodhisattvas of compassion and power. In the upper left corner of the composition is the standing form of the historical Buddha of our eon, Shakyamuni Buddha, who stands outside the entire Wheel of Existence and looks upward pointing towards the white orb of the full moon. In Buddhism the image of a finger pointing towards the moon is widely used as a symbolic metaphor for the path to liberation, with the moon itself representing full enlightenment. “With the application of effort, and in order to escape (from the wheel of samsara), one should engage in the teachings of the Buddha. “The realms of the gods, asuras, humans, animals, hungry ghosts, hells. Ignorance, formative actions, consciousness, name and form, sense bases, contact, feeling, craving, grasping, existence, birth, aging and death. The three poisons: the path to liberation, and the way to the lower realms.